With Büchertiger Supplies I founded the shop which I would have wished to find when I started out binding books. Especially coloured linen thread was very hard for me to find in the beginning, and it took me a long time to search for suppliers. I then found out that I had to buy largely in bulk – and thus a business was born. I first sold excess and soon bought to sell. I put a strong emphasis on customer service. 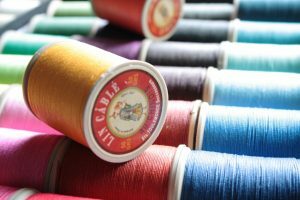 I enjoy helping customers to choose the thread that is right for them, and love to hear about their projects. Beside thread I also stock parchment pieces, ideal for training both caligraphy and small parchment bindings. Well, so let me show you my most important stock – the thread! You can order via email or telephone, or just head over to one of my online shops that you can find in my where to buy section. This German linen thread is firmly twisted and then calendered which makes it strong and gives it a faint sheen. It is not waxed. It is advisable to wax it by hand (it can be machine waxed if you have a waxing machine) before using it to sew leather. If you are going to use it for bookbinding you probably will want to wax it, too. With some experience, it can be used non-waxed for smaller volumes which for open spine bindings has the advantage of no wax on the outside. This is an advantage since wax attracts dirt and dust like a magnet. There are 20 different colours available from Gruschwitz. Most have a beautiful, natural greyish-ness to it, characteristic of only mildly bleached threads. 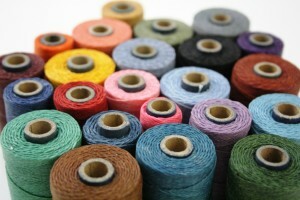 This linen thread – produced in England – is the newest addition to the range of linen threads that I stock. It is available in 4-ply and 3-ply, is non-waxed and of very high quality. It has not been calandered like the Gruschwitz thread which gives it a matte finish and makes it softer than other bookbinding threads in my stock. It should be waxed before sewing leather with it. If you are going to use it to bind books you probably want to wax it, too, because the wax makes the thread on the one hand slightly sticky, which makes it easier to makes knots and looks, at the same time it reduces fraying and accidental loops. However, with a bit of practise it can be used as it is, which has some advantages, especially when you are sewing exposed bindings where the wax on the thread might otherwise attract dust and dirt. 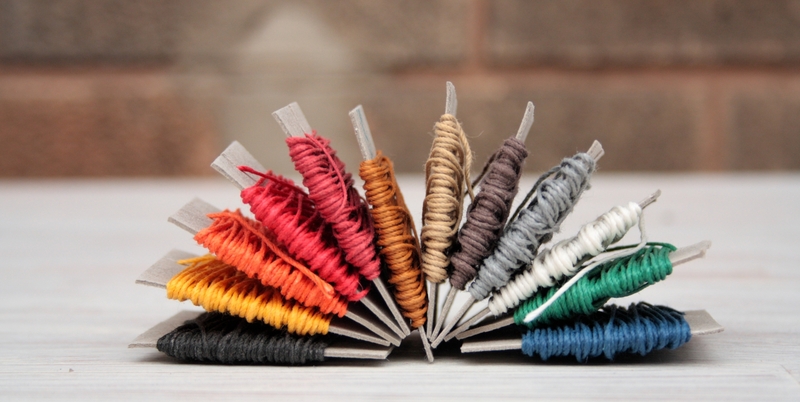 There are 12 colours available of the 4-ply thread, and unfortunately only 9 of those also for the 3-ply. 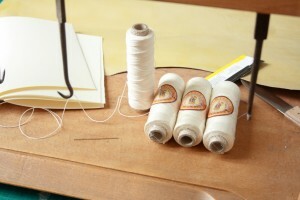 Crawford’s waxed Irish linen thread is used for a variety of traditional crafts, including leather sewing, bookbinding, and all sorts of crafts that include knotting (like macrame and basket weaving) like all linen threads. It is by many considered the best thread for beginners and when making Coptic bindings as the thick wax coating makes it easy to handle and let the chain pattern on the book’s spine stand out nicely. 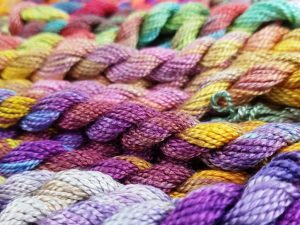 I have the largest selection of colour in the 4-ply range, but also occasionally have other sizes in stock. Before using it, it is advisable to run it between your fingers several times to get rid of excess wax and to give a smoother finish and thread. 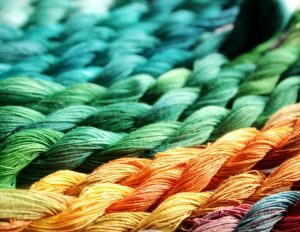 The wide range of different colours is the main advantage of this thread. With broad selection of bright colours to choose from, it is rare not to find a match. Some of the colours in my shop can’t even be found in other stores, like coffee, dark moss or cherry. 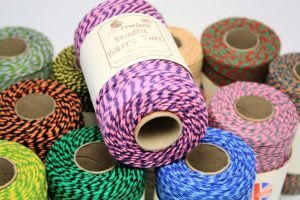 The Goldschild line thread is advertised as Londonderry thread in the US and there only sold on 30m spools. I carry the 25g spools, and the whole range of 26 colours in thickness NeL 18/3. Goldschild thread is not as tightly twisted as the other linen threads in my range, and therefore feels softer. It cannot be broken by hand but has to be considered weaker, especially since the weaker twist makes it more vulnerable to abrasion damage. When waxed before usage, it holds up reasonably well for sewing books. However, due to its weaker structure, I can only recommend it for light (one or two section) bindings, and for stab bindings like an Asian binding. It would be suitable for sewing headbands, though, and could be a really nice touch on a rustic book for which silk thread doesn’t quite seem to match the style. Goldschild thread is a top choice for as a crochet or embroidery thread. The thread is not suitable for sewing leather. Ah, lin cable, the most lush among the linen threads. This thread has been cabled, which means it has been twisted twice. This makes the thread especially even and round and enhances abrasion resistance and strength in general. When viewed from very close it looks more like very fine rope rather than thread (that’s the look of the cabling). It is thinly waxed before cabling which gives the thread its luxurious sheen whithout making it the slightest bit sticky. Without a doubt this is the best thread you will find for creating leather products. 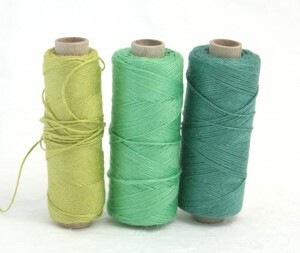 Like other linen thread it can be used where-ever a strong thread is needed. For example for creating puppets on a string, just to name one. 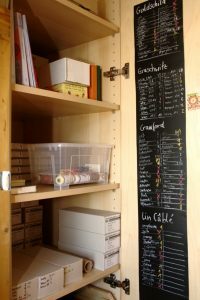 And of course it can be used for bookbinding. As it is so especially strong, it is not suitable for conservation work. The thread is produced in 5 different thicknesses, I currently stock 44 colours in their two thickest calipers (called 332 and 432), and a smaller variety in the thinner sizes 532 and 632. 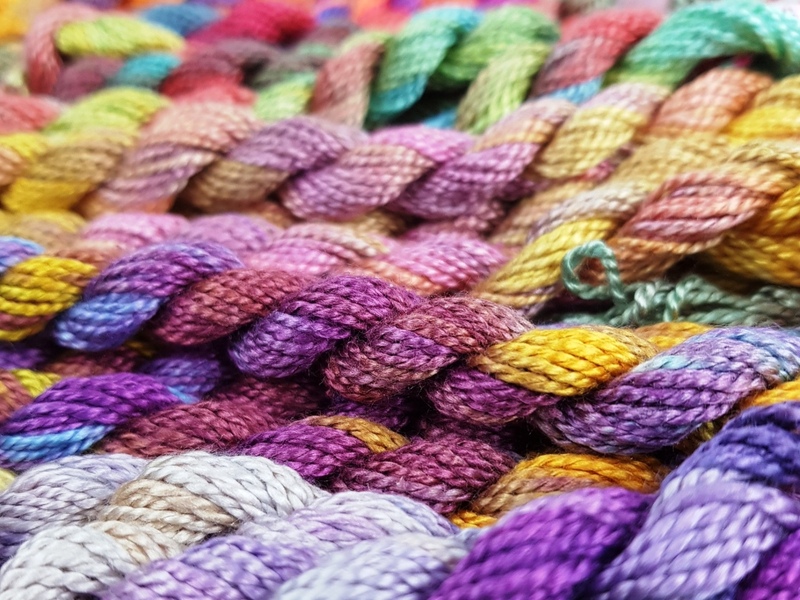 I am planning to expand the range of available colours and thicknesses slowly over time, so feel free to ask if you are interested in a colour or thickness that’s not currently listed. 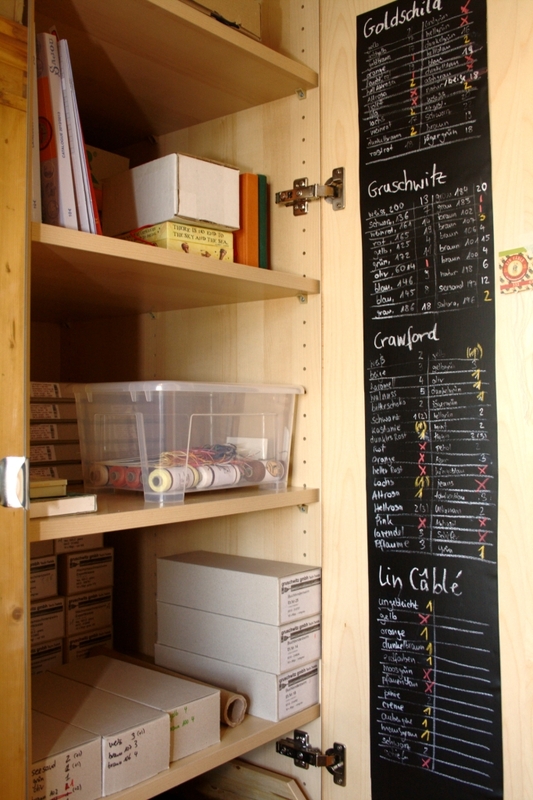 I am stocking professional bookbinding thread from Fil Au Chinois (France). It is of course 100% twisted linen thread, made from the longer line part of the flax fibre. This thread is suitable for conservation work, and meets the highest requirements. 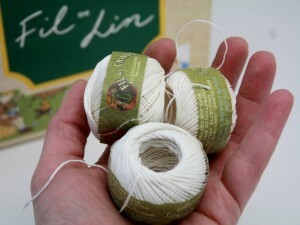 The Fil Au Chinois, Lin Retors thread is available in the thicknesses 12, 20, 25, 30, and 40. The thread is thicker if the number is lower. This thread should be hand waxed before usage. This French linen thread is a pleasant simple kitchen thread. It is sold in 30m balls in only this one white colour. It is food safe, and can be used to tie up meat, cabbage rolls, or whatever you need to tie and then cook. Apart from kitchen use it is good for all kinds of uses, from building kits to wrapping gifts. It is probably the strong thread your mother or grandmother had in that drawer in the kitchen. It is produced in three different thicknesses which I all stock. I only wish the thread was a bit thicker. – This is a wonderful linen thread. 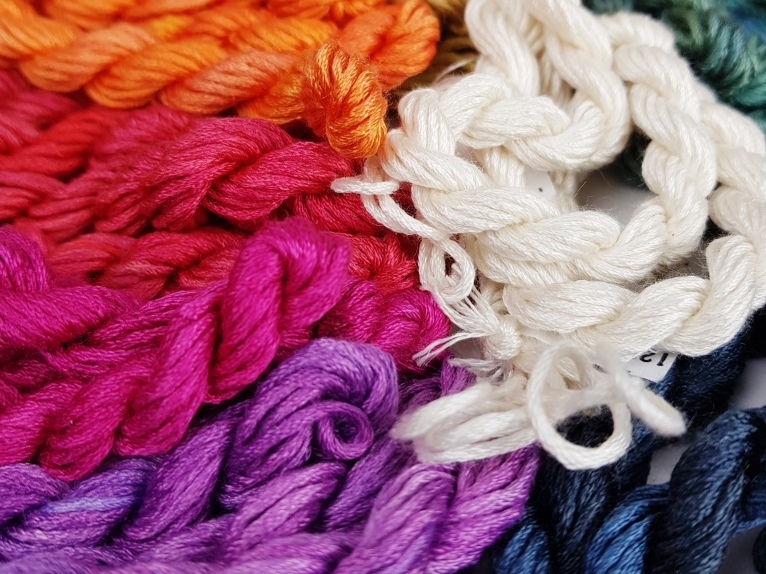 Great for lace, crochet and embroidery, and it comes in wonderful, space-dyed colours. Nm 60/3 converts to NeL 100/3, so it is fairly thin. 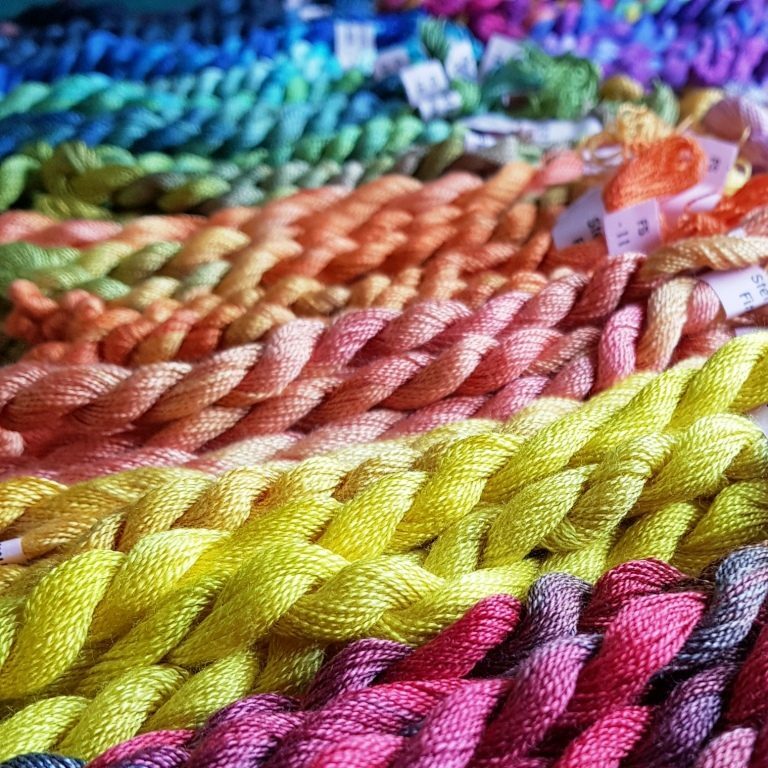 Stef Francis is a family owned small business that hand dyes all their threads in South England. This thread is sold on skeins which hold 57m of thread. Fine silk thread is prefect for traditional headbands. It can also be used for miniature or other slim books, or for Asiant stab bindings when used in double or tripple thickness. 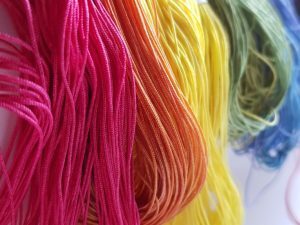 Stef Francis is a family run small business in South England where the thread is hand-dyed. There are lots of wonderful colours available, some just have a slight variation that makes the colour pop and appear more organic, others come in wild varigations. This thread is sold on skeins which hold 28m. Kojiro Ikegami (Master Craftsman of Japanese Bookbinding) recommends Perle 5 silk thread for most (Asian stab) bindings. I also used it for endbands for slightly more rustic volumes. The beautiful, lustrous quality of silk still makes it look gorgeous, and the thickness makes for quick stitching. Of course it can also be used for general embroidery and stitching. Like all Stef Francis threads these are hand-dyed in a range of beautiful colours from faded tones to popping colours. This silk thread has an incredibly beautiful shine and deep saturated colours. I used it for endbands. It is not easy to use, as it consists of a multitude of fine fibres rather loosely twisted, and which thus like to hold on to the spine lining, or even just to dry flecks on my hands. But it’s well worth the trouble using it. I have never seen a thread more beautiful than this. Sold on skeins, each holds 36m of thread. This is a medium to thick yarn that can easily be split down to fewer strands if a finer thread is required. It is hand dyed in South England by a family run business. 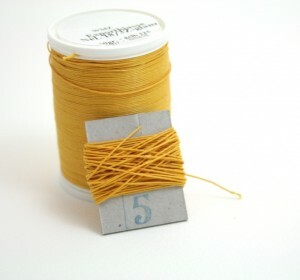 The number of strands in the thread is 12, and the thread in one skein has a length of 6m. Being a bookbinding I myself am always looking for how to use thread for books, and I found that this is a really beautiful thread to use for Asian stab bindings. 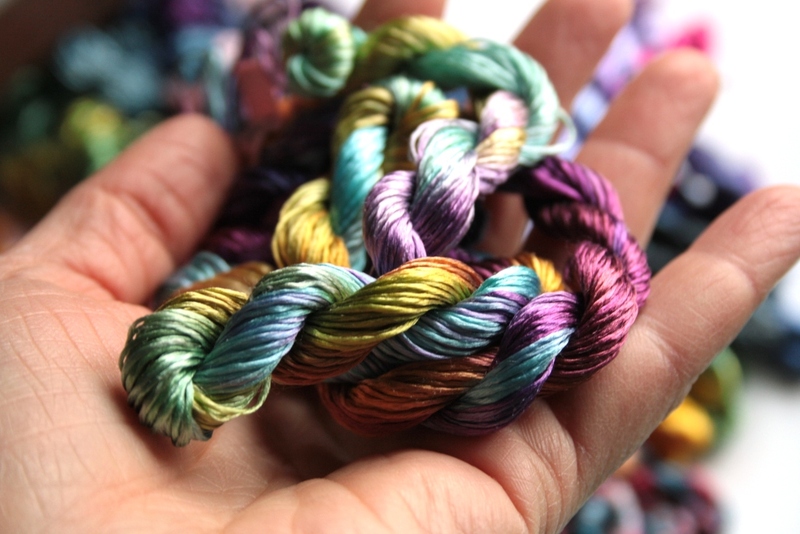 This braided silk is an incredibly strong silk braid of medium weight. 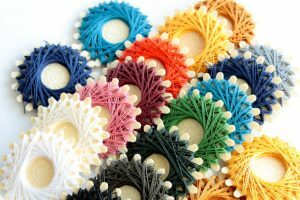 It is useful in embroidery as it is very round and has a central core. It is useful in general craft work where the high strength can be asset; for example for jewelry making, for making a necklace, etc.For bookbinding I see it mostly as a thread for stab bindings and decorative elements like tassles on stab bindings. 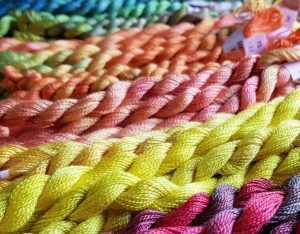 Stef Francis is a family owned small business, and all thread is hand dyed in South England in an extensive range of varigated colours. 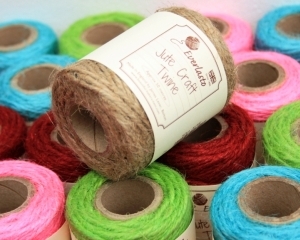 This Everlasto Jute twine is relatively coarse and available in 5 different colours. One spool has approximately 50m. It is made of 100% jute which is a natural fibre which makes the thread biodegradable. It can be used for all kinds of knotting and binding in the garden. I also use it for book cords, and for crocheting things like containers and coasters. This 3-ply waxed linen thread is usually too thin for bookbinding (diameter approx. 0.43mm). But I use it for miniature bindings, where it is perfect. It is also suitable for beading. Its intended use is for sewing anything that needs a strong seam, from sewing on buttons to sewing heavier materials like jeans or leather clothing. This thread is not suitable for use in a sewing machine. It comes in a wide variety of colours of which I currently stock fourteen. 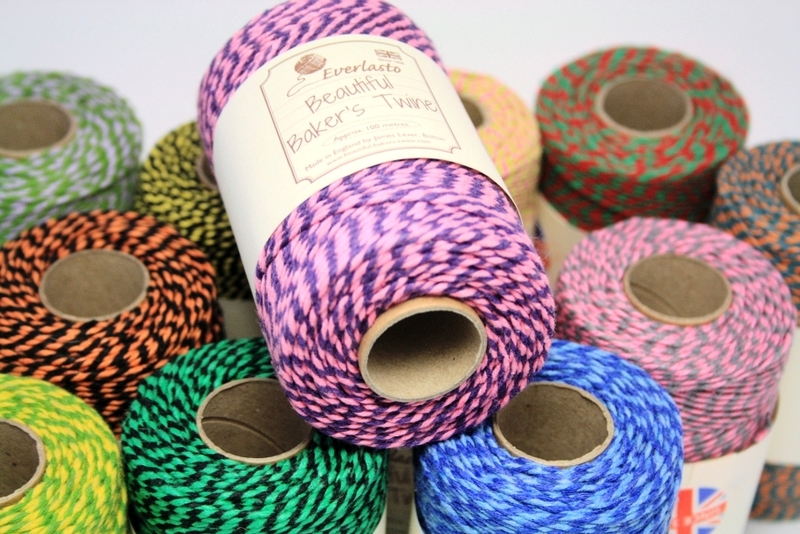 Everlasto Baker’s twine, a beautiful 100% cotton thread ideal for a wide variety of paper projects and for packaging. 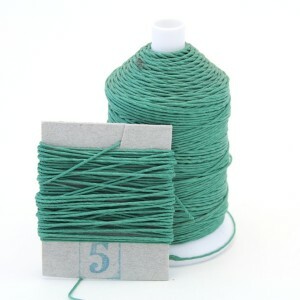 Both the thread and its packaging are biodegradable which makes it a ecological choice and usable in the garden, too.